Westcoast SCI - What is the gluteus medius and why is it important for runners? What is the gluteus medius and why is it important for runners? Your gluteus medius is one of your three major gluteus muscles. The gluteus medius is located on the side of your hip and attaches from the top of your pelvis to the top of your thigh bone. 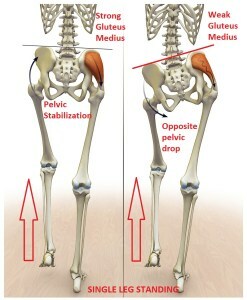 The gluteus medius is in charge of the action of lifting your leg to the side and stabilizing your pelvis while it bears weight - especially when running. It also helps your bigger gluteus maximus muscle flex and extend your leg. Having strong glutes is important because we use our glutes in everyday life when you push off the ground while walking, running, or stepping. Why is it important for running?? The gluteus medius muscle is often forgotten in the workout routines of runners and athletes. Having good strength and endurance in your gluteus medius can help prevent injuries. A weak and unstable pelvis can lead to compensation in the low back or improper tracking of the knee leading to injuries in your knee or foot. As we mentioned before, the gluteus medius helps stabilize your pelvis while performing single leg movements - like taking a step while running. Studies have shown your gluteus medius produces the most peak muscle force out of all of your hip muscles when you run. Absorb force of the ground pushing back against your leg as your foot hits the ground. Prevent your knee from adducting (collapsing inwards) while running. What happens if your gluteus medius is weak while running? A weak muscle can cause increased stressed in other muscles and structures around it. Collapsing of the knee or a pelvic drop while running, shown in the images above, can place additional force on the knee or ankle which may lead to the development of low back pain, knee, ankle or foot injuries. Having a strong gluteus medius and other hip muscles is especially important as you increase your running distance or intensity. Training your gluteus medius so that it has enough strength and endurance is important for safe, efficient walking and running, and preventing future injuries. How Do I Train My Gluteus Medius? So how do you go about training your gluteus medius? Gluteus Medius is most active when performing isolated single-limb exercises. Check out the video on the right to learn more about what exercises help strengthen the gluteus medius. Book an appointment with our physiotherapy or kinesiology team to learn more. Our individualized running assessment, with our running specialists is a great way to help improve your running technique or address running related pain. Newer PostWhat is your core? Older PostWhat exactly are your "glutes"